Explosive claims, political pay cuts and a loyalist resignation all make the headlines on Friday. Jonathan Bell's appearance in front of the Renewable Heating Incentive (RHI) dominates most front pages. The former DUP minister gave evidence to the body in the Senate Chamber at Stormont on Thursday. The RHI inquiry was set up to look into the running of the botched heating scheme which hoped to encourage the uptake of eco-friendly heat systems. But, overgenerous fuel subsidies meant it could cost taxpayers and extra £490m. On Thursday, Mr Bell made a number of explosive claims. He said a senior figure in the Executive Office was briefing against him as a "monster who had to be put to sleep" - a quote which appears on the front page of the Belfast Telegraph. 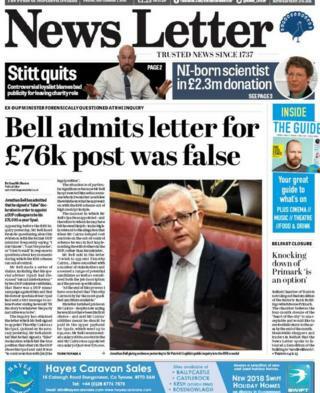 Mr Bell also admitted signing a "false" declaration to appoint a DUP colleague to be his SpAd, reports the News Letter. Meanwhile, Mr Bell also made further claims about the culture within the DUP, which is the main story in the Irish News. Its headline reads: "Bell tells RHI inquiry he heard explicit details of DUP ministers' sexual misbehaviour". In response to the claims, the DUP said: "It would not be appropriate to comment on evidence given to the public inquiry, outside of the inquiry process. It is important that the inquiry is allowed to complete its work." Elsewhere in politics, MLAs' salaries are due to be slashed in two stages beginning in November. The announcement was made in by the Secretary of State Karen Bradley in the House of Commons on Thursday. Northern Ireland has been without an executive since January 2017 following a bitter row between the governing parties, the DUP and Sinn Féin. 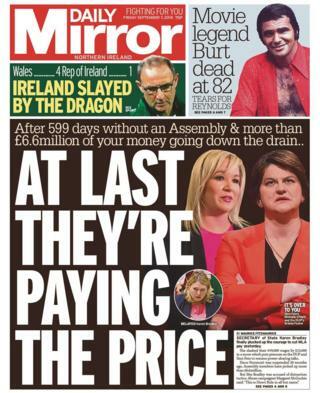 The pay cut makes the front page of the Daily Mirror, which reads: "At last they're paying the price". The paper reports that parties across the border have largely welcomed the move, however Margaret McGuickan from Survivors and Victims of Institutional Abuse told the paper: "This is Direct Rule in all but name". The resignation of a leading UDA member as chief executive of Charter NI features in both the Irish News and News Letter. Dee Stitt resigned on Thursday, however he will remain with the organisation as a "project manager". He had been under growing pressure to step aside after his paramilitary connections were revealed. In a statement, Charter NI said "negative media attention has been a great strain on David and his family" and thanked him for his "commitment and dedication through difficult times". The Daily Mirror also reports on the Coroner's Court findings into the death of Cranberries front woman Dolores O'Riordan. The singer, who died suddenly on 15 January aged 46, was found submerged in the bath in her room at London's Park Lane Hilton hotel. On Thursday, the coroner said O'Riordan died as a result of a "tragic accident". She had no injuries or evidence of self harm, and had drunk an excessive amount of alcohol, expert witnesses said. The Irish News reports that the family of an Official IRA man who was allegedly shot dead by British soldiers in 1972 are to take legal action against the Ministry of Defence (MoD). His family are to issue a civil writ against the MoD and the attorney general for alleged unreasonable delays in conducting an effective investigation into his death. Holywood golf star, Rory McIlroy has sold his house in Florida, according to the Belfast Telegraph. The 10,500 sq ft home was on the market for a total of nine months, with an asking price of $12.9m (£9.9m). McIlroy and his wife, Erica Stoll, have now moved to another luxury pad in Jupiter, Florida, which was previously owned by South African golfer Ernie Els.